Here&apos;s a great piece from ARN Mercantile&apos;s Spring/Summer 2011 collection—the entire line is a unique blend of English heritage, Japanese design, and 1900s classic menswear. 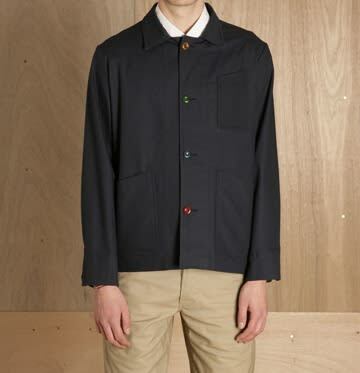 This chore jacket is made of navy cotton and it features a collar, long sleeves, with a beige marbled button on one side and a green one on the other. It is closable in the front with 4 buttons in green, blue, beige, and turquiose and has a chest pocket as well as 2 patch pockets. The inside is detailed with piping and features striped inside pockets. If that&apos;s not enough details for you, it&apos;s also made in England. Available now at LN-CC, $335.